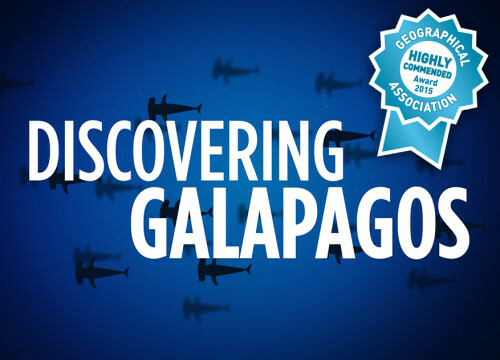 We are proud to announce that after just eight months of being live, Discovering Galapagos has won an award! The Highly Commended Award was presented to us on 9 April 2015 at the Manchester Conference Centre as part of the inauguration event of the 2015 Geographical Association Conference. This free resource includes stunning high-resolution photos, information, video and interactive resources. The website provides up to date information on a new case study of this unique environment, which will engage pupils and expand their ideas about different locations. Written with the 2014 National Curriculum in mind, it covers both the physical and human landscape and includes comprehensive lesson plans for geography and science at key stages 2 and 3. The multi-media resources, high-quality video and attractive and accessible downloadable resources would also be ideal for independent research. When setting up this education programme we hoped to be able to teach students about the challenges of ensuring a sustainable future for the planet by using interesting case studies from the Galapagos Islands. We believe that today’s school students are tomorrow’s conservation ambassadors and the future stewards of our planet. Therefore, we see education as one of the most important aspects to long-term conservation strategies. We are extremely pleased to have received this Highly Commended Award from the Geographical Association and we are happy that our objective of providing educational material about Galapagos and the importance of conservation is been achieved and recognised by the academic community. A big thank you for all the support we have received from individuals and organisations whilst creating the Discovering Galapagos website. We look forward to building on this success by continuing to add new resources, activities and case studies from these incredible islands. Categories: Discovering Galapagos News, Discovering Galapagos Updates.